Mashup Turns Messages Of Hate Into Poetry Preaching Love : All Tech Considered A gay couple in south Florida is taking on a church known for its anti-gay protests. Using social media and a black magic marker, they're taking the church's inflammatory rhetoric and turning it into conciliatory poetry. Internet domain names come in all shapes and sizes, though perhaps none is as notorious as GodHatesFags.com. It's the Web site of the Westboro Baptist Church, an independent Baptist church in Topeka, Kan., best known for protesting the funerals of gay people who died of AIDS or were victims of hate crimes, as well as funerals of American soldiers. The Southern Poverty Law Center, which tracks extremist organizations, classifies the church as a hate group. Westboro Baptist Church is also a prolific publisher of press releases that often contain the same rhetoric found at their protests. The press releases are an opportunity for the church to spread their ideas, using phrases such as "Military funerals have become pagan orgies of idolatrous blasphemy," "America is a nation of sodomite hypocrites," and "God hates fag-infested & fag-enabling Lincoln, NE." To Kevin Cobb and Andres Almeida, though, the press releases have become an inspiration for a counter-protest in which they create poetry utilizing bits and pieces of the press releases. Cobb and Almeida, a couple from south Florida, recently launched a blog called GodLovesPoetry.com. In each blog post, they take a printout of a Westboro Baptist Church press release and begin redacting it with a black marker. They keep redacting and redacting until all that's left are a few words that create a poem that turns the original rhetoric of the press release on its head. They then create an artistic representation of the poem and redacted text, which they upload to their blog. An original press release denouncing a John Mayer performance. The poem that came of it: Hate / MAY / perfect / fear / but / grace / forgive s / sin. An original press release announcing a protest at a soldier's funeral. The resulting poem: GOD / gave life / to / the / homosexual. A similar press release announcing a protest at another soldier's funeral. 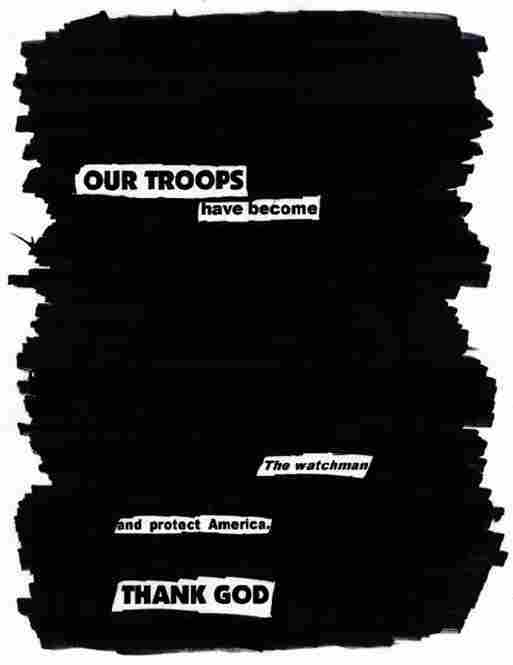 The resulting poem: OUR TROOPS / Have become / The watchmen / And protect America. / THANK GOD. "I work in the media so I'm familiar with the Westboro Baptist Church's press releases, which are faxed to hundreds of media outlets daily," Cobb explained to me via email. "I've always wanted to do some sort of art project but I wasn't sure where to start. 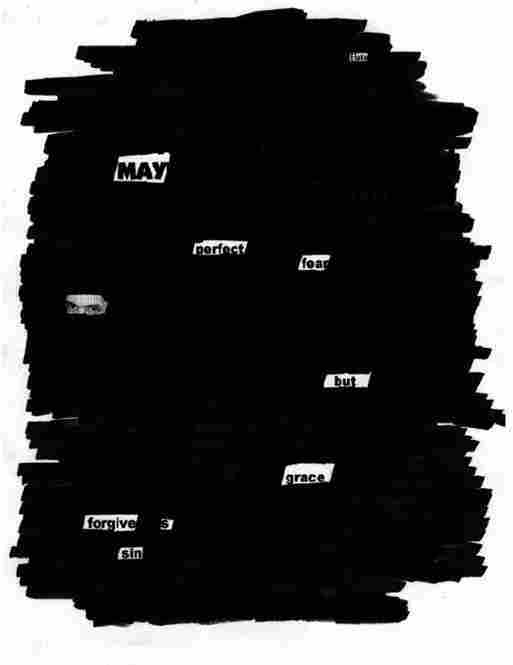 Then I came across Newspaper Blackout, a blackout poetry project started by Austin Kleon. We ordered his book and as soon as we received it, Andres strongly encouraged me to pursue the idea of combining the press releases with the blackout technique." Meanwhile, their poem on September 16 was inspired by a March 12 Westboro press release entitled "WBC TO PICKET FILTHY FORNICATOR JOHN MAYER AT THE SPRINT CENTER." The press releases they've tackled have been from the church's online archives as well as more recent ones. Cobb and Almeida say they hope to keep up with new press releases as they're published. On one level, GodLovesPoetry serves as a simple, yet effective example of how people are employing free social media tools for getting out their message. In this particular case, Cobb and Almeida are using Tumblr as a blogging platform, along with their Twitter account @godlovespoetry to spread the word about their poems. Cobb said he hopes their project can serve as an inspiration to nonprofits that could benefit from embracing these tools, or others like them. "It's a good way to let nonprofit organizations know that, through social media, you can spin something negative into a positive," he explained. "There's such a large opportunity for them to engage the public by crowdsourcing ideas and content. At the very least, we'd like for them to be encouraged to reach out to the community more actively using new media methods." On another level, though, GodLovesPoetry is a classic example of a political satire mashup: taking a particular political message and inverting it, physically distorting the message to create a counter-message. 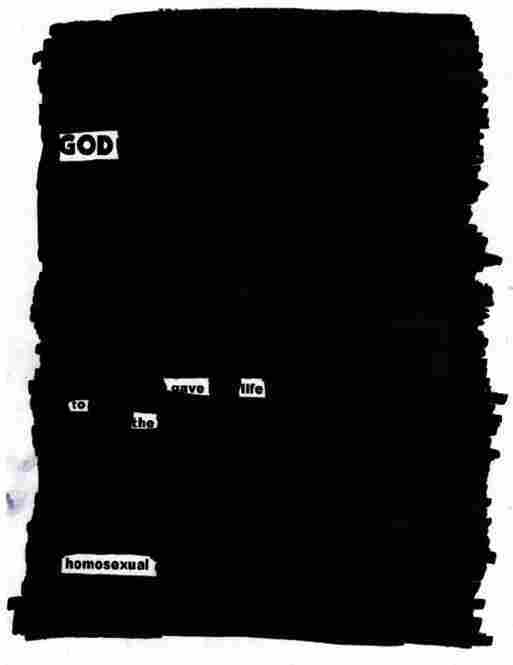 The act of redacting the documents subjugates and subsumes Westboro's texts literally by blacking them out, leaving seemingly innocuous bits of words and phrases that go completely against the church's rhetorical intentions. Format-wise, it's not that different from the political mashups you might see plastered on telephone polls around Washington DC by protesters on any given day. By scanning the resulting poems and spreading them through social media, though, Cobb and Almeida up the ante further. They're utilizing tools -- in this case, Tumblr and Twitter -- that the church hasn't adopted yet. As is the case with GodLovesPoetry.com, taking satire into the social media space is often effective simply because the entity they're satirizing has little or no understanding of social media, or are unprepared to counter it in that particular space. Take the Gulf oil spill, for example. While BP struggled to use Twitter and other social media tools to spin their own perspective, the fake Twitter account @BPGlobalPR pulled the rug from under them, dominating the social media realm with its wickedly funny parody of corporate PR-speak. "Social media is such a powerful tool and it's fascinating to see how people and companies can underestimate it," Cobb continued. "In a way, that's what we're doing -- we're spinning their message similar to how @BPGlobalPR did, although we're not necessarily trying to raise awareness about the WBC [Westboro Baptist Church]. They do that pretty well on their own." Perhaps the most powerful aspect of the poems, though, is that they're a spiritual response as well as a political and technological one. Rather than fighting fire with fire -- addressing religious anger with anger of their own -- Cobb and Almeida are employing the Christian tenet of turning the other cheek. They're responding in a way that's rooted in virtues most people can agree on: tolerance and love. "It can be more effective to use creativity when responding to hate instead of being angry," Almeida said. "The few poems we've done so far have been therapeutic and empowering, especially because the WBC's original press releases are filled with so much garbage." Even the name itself -- GodLovesPoetry.com -- inverts the church's rhetoric with a spiritual expression of love. "It's a play on everything they oppose, which is pretty much everything."